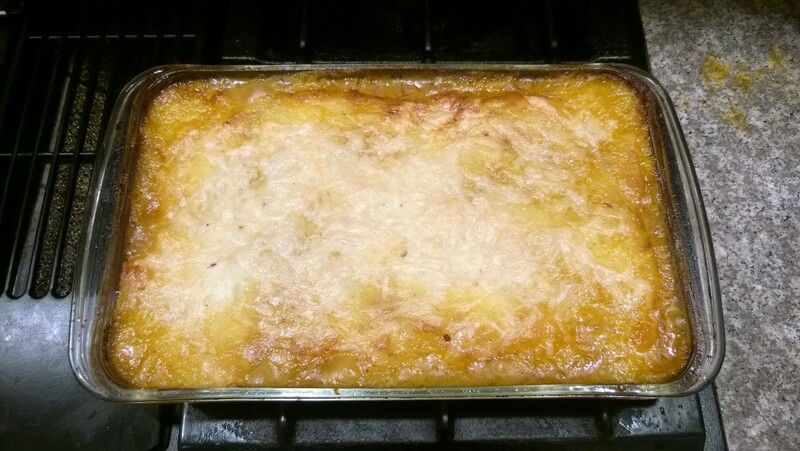 Shepherd’s Pie is a staple around here in the colder months, when we eat a lot of one-dish meals. The other night we were feeling lazy and wanting comfort food, but we were low on fresh vegetables. There was a package of ground lamb in the freezer, along with a bag of mixed frozen vegetables, so I thought, why not make a slightly spicier version of the lamb mixture to offset the fact that frozen veg are usually blander and mushier? TheHusband agreed that it sounded like a worthwhile experiment, so we went to work. He made mashed potatoes while I put the curried lamb together. Peel and cut up potatoes. Put in a saucepan, cover with water, bring to a boil, and simmer briskly until done (time will vary depending on potatoes). Drain, reserving 1/2 cup of the water. Mash the potatoes with the butter and milk. If you need more liquid, add some of the potato water. The consistency should be creamy but not too wet, so that they can be spread over the lamb mixture. Set aside. Heat the canola oil in a wide saucepan or deep skillet. Add the cumin seeds, whole cloves if you’re using them, and the cinnamon stick. When they’ve browned, add the garlic, ginger, chile, and onion. Cook on medium heat until the onions are transparent and starting to brown, about 5-7 minutes. Add the lamb and cook until the pink is almost gone. If you’re using fresh vegetables, add them now. Add the tomatoes and their juice and cook for 2-3 minutes. Add the turmeric and garam masala (and ground cloves if you’re using them) and cook for another minute. Sprinkle the flour over the mixture and stir to combine. Add the salt. Cover and cook for 15 minutes. If it starts to dry out, add water (plain or the leftover potato water). Add the frozen vegetables now if you’re using them, return everything to a boil and cook for another 10 minutes. (If you’re using fresh, just keep cooking the lamb mixture for another 10 minutes). Uncover and take a look. If the mixture looks too soupy, simmer briskly to reduce the liquid. Remove from heat when done and spread in a medium-sized baking dish (8×8 or 7×10 both work). Then spread the mashed potatoes evenly over the top of the lamb (I use an offset spatula), the way you would spread icing on a cake. Be careful not to stir the lamb and potatoes together; you can heat up the potatoes if they’ve become cold and difficult to spread. Some people use a fork to make curlicue patterns in the potatoes, but I just leave them smooth. It’s totally up to you. Sprinkle the cheese over the top of the potatoes. Bake in a preheated 400F oven for 30 minutes, or until the cheese is browned and the lamb is bubbling. Remove and let the pie rest for at least 5 minutes. Serve as a one-dish meal or with a salad on the side. Enjoy! NOTE: You can substitute ground beef for ground lamb (curried cottage pie) or even ground turkey or chicken. I’ve substituted ground turkey when making kheema and it works well. You might need to add a tablespoon or two of butter to mimic the creaminess that lamb and beef fat provides, but it will still be pretty healthy.